In a large mixing bowl beat together your butter and sugar until it has a whipped texture (about 1 minute). Mix in your eggs and milk. Now mix in your flour and baking soda. Once your batter is mixed, mix in your cotton candy flavoring. Separate your batter into 3 separate bowls, add 2 drops of food coloring to each bowl to make 3 separate colors. Scoop in 1 Tablespoon of each color batter to each baking cup. Bake for 20 minutes then let cool. 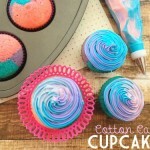 While your cupcakes are cooling, separate your frosting to 3 separate bowls, and add 2 drops of food coloring to each bowl to make 3 separate colors. Scoop each color into a different decorating bag and cut the tips off the bags. Remove the ring from your coupler base and drop the coupler into a empty decorating bag, cut the tip off the bag, and place your star tip onto the coupler, then place the ring back onto the bag. Place your 3 frosting filled bags into the empty bag and twist the top.